In the 19th Century sugar growers in Hawai’i imported laborers from many parts of the world. One of these countries was China. When the Chinese workers completed their contracts most returned to China, with their savings; but some remained in Hawai’i. the Chinese laborer’s who settled in Keokea raised vegetables. Their produce was shipped as far as California and fed Chinese laborers who built the railroad through the Sierra Nevada mountain range. Much planning for the future took place at these World Society meetings as Father Shim arrived in 1900 and by 1906 orders for a plain wooden Church had been placed and materials had arrived at Makena landing on the sea coast abt. 3,000 ft directly below the proposed building site. 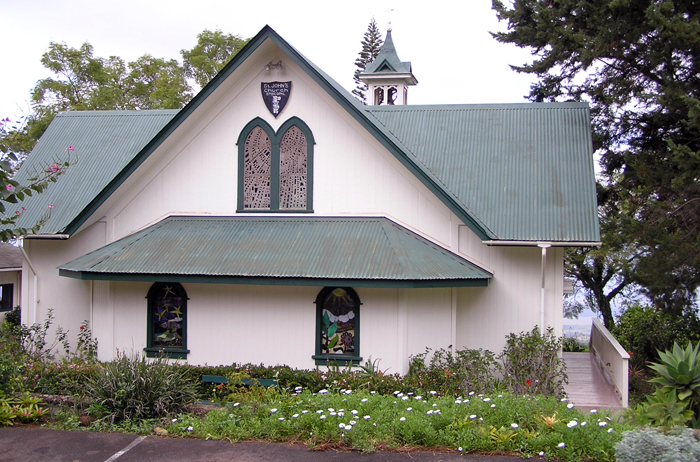 The materials were delivered by horse drawn wagons and by 1907, the church had been built. It was designated an Anglican Church because there was no Lutheran church here. Fr. Shim was ordained Deacon in 1905 and as priest in1909. Father Shim returned to China in 1910 and brought his two sons, Wai On and Wai Cheong back to Maui with him. His wife, Kui Kyau Shim, and two daughters, Don Lyam and Dyun Lyam. arrived in 1915. Father Shim died June 26,1918. In 1923 Mrs. Kui Kyau Shim came back to Keokea from Honolulu at the request of Bishop Restarick and served here as “Sunday School Superintendent” and “Bible Woman” for many years. Old-timers speak of Mrs. Shim as a woman who wore black and made visits on Sunday afternoons to the homes of people who missed church that day! Christmas Eve is remembered as a time when children received paper bags filled with hard candies, nuts and an orange. Another special treat was on that night, the children were allowed to drink a cup of coffee. Mrs. Kui Kyau Shim taught the people, prepared them for baptism, and confirmation and organized priests from Good Shepherd who came regularly to serve communion. Mrs. Shim retired in 1944. The oldest son of Yin Chin and Kui Kyau, Wai On was a priest who came and served at St. John’s from time to time. The first English speaking priest, the Rev. Hugh Thompson, came to St. John’s in 1949. Many priests came to St. John’s and served short periods of time. Father Shelton Hale Bishop served for a year 1961-1962. Vestments, which are still used today, were created by the women of St. Phillips in Harlem. Father Shelton Hale Bishop had retired after serving St. Phillips for several decades. Father Bishop had a gas heater installed in the church and actually died in the new St. John’s Rectory in 1962. The Rev. Jefferson Stevens and his family were the first people to live in the new rectory. It was built in 1960 and the old rectory was moved down Kula highway about a mile. One of the most beloved priests to serve at St. John’s was The Rev. Norman Ault. His name still falls lovingly on my ear when people remember their weddings and his ministry at the funerals of parents and friends. In 1976 St. John’s Mission became a parish under the leadership of The Rev. Peter Van Horne. With great effort and a lot of support from many people, St. John’s has not only remained a parish but has gone through several major renovations and expansions. In 1981 St. John’s called Heather Mueller – She was the first woman to be called to be a rector in province VIII. In 1985-1987 St. John’s renovated the church, added a choir space and purchased a tracker organ from germany. The Parish hall was enlarged to include 3 classrooms, 2 offices, a conference room, an attic space, 4 bathrooms, and an expanded kitchen space. The renovated and expanded spaces have been put to good use through out the years. We have housed musical presentations, youth groups and groups looking for space to come together and explore spirituality and community issues. In 2001 an opportunity presented itself for St. John’s to acquire the land below and to the Kahului side of the church. With a lot of great support and good planning we were able to buy 4.4 acres and in doing this we could accommodate some additional programs or projects in the future. We have also protected the space around the church from development. The current 2009/2010 project is the reorganization of the St. John’s cemetery. We have laid it out to provide paths and a space for a gazebo. We are about to install a pathway to the lower land. We hope to construct the pathway with memorial pavers. The installation of a columbarium is on the near horizon.